This Part 2 explains how to varnish, step by step helping you with correct application and finish. To read the introduction to why we have to do it, and which varnishes to choose, take a look at All About Varnishing – Part 1. Have room underneath to run a cloth or paper towel along the underside once the varnishing is finished, so you can wipe up all the excess drips. Now grab your brush and varnish bottle. What type of brush? I use a large flat hog bristle brush that does not leave hairs behind. For selecting which varnish, refer to the Part 1 of this article. Work quickly but gently, most important of all, try to minimise the brushstrokes so that bubbles are not created all over the surface. There should be only three phases of brushstrokes, once, diagonally to spread the varnish across the whole surface. Make sure no spots are missed by bending down and looking across the surface with a bright light above, (or towards a window) to see areas that are matte that have been missed. Brush along all the sides. If you have a heavily textured painting, try to push any excess varnish out of puddles. Wipe the underside of the painting (with a clean section of paper towel for each side) to get rid of any big drops that have run down. Leave the painting laying down horizontally, as it is, to dry. Hopefully you have done it in an area that has good airflow, is free of dust, insects, kids and curious cats and their paw prints! It’s good to do this in a room where you can walk away and leave it. The fumes will get to you after a while! They are really not good for you. Allow the varnish to dry overnight before re coating, repeat all the steps above. Do You Hate Cleaning Out the Varnish Brush? So do I! I hate having to use turps to clean out the solvent based varnish brush every time I use it. I have worked out a great trick to keep the brush moist and not drying out overnight. Sometimes this keeps the brush wet for days. Have a roll of aluminium foil stored in your studio. Wrap the brush bristles (still wet with varnish) and down the handle tightly in the foil, pressing out all air pockets. Make sure to double over or triple over the seams. Scrunch it really tight around the handle so no air gets in to the brush bristles. This will keep for days if you have done it right, but definitely overnight until you are ready to do the second coat. If the weather is really hot then pop it into the fridge overnight for extra insurance. An art restorer from QAGOMA (Qld Art Gallery & Gallery of Modern Art) told me that if you heat up the W&N varnish gently (like placing the varnish container in a bowl of warm water beforehand) then it goes on better. The same art restorer told me that if you varnish too soon after painting (for both acrylic and oil) then the two surfaces bond together more than they should and the varnish will be really difficult to remove later on. While spreading out the varnish, if you find the brush drags heavily then there is not enough varnish poured out: pour on some more! Switch off the lights in the room where you leave the varnishing to dry, so that insects are less likely to fly in and commit suicide in the varnish. I am telling you this from experience! If you varnish on a hot day or in a hot dry room, it will dry too fast before you can lay on all the brushstrokes you need. If you varnish on a cold day or in damp conditions then it will take much longer to dry. Do not transport paintings or lean them up against things or wrap them until the varnish has cured completely – this may be a week or even more. New varnish tends to stick to things. Bubble wrap is the worst. It will leave a pattern of circles across your painting. Try to keep everything off the surface until it is fully cured. The best place to put a recently varnished painting (that is dry) is on a picture hook, up on a wall! Make sure that you are not going to touch your painting again because after it has the final coat of finishing varnish, you must not paint over the top of it. You may have problems with the layers delaminating later on (i.e. peeling & lifting – bad news!). Also when the varnish is removed your touch ups will be removed with it! 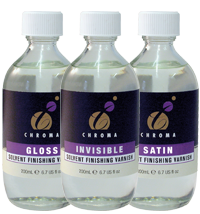 Retouching varnish is made from chemicals that are compatible with your paints and mediums, so you can paint over that. But make sure you are completely finished before you apply the finishing varnish, because you should never paint over the top of that! Check out the latest post on Acrylic Mediums for more information on how important this is. What have you created lately that needs varnishing? Where do you buy your W&N Artists Varnish? I’m in Gympie, with no art store near me and I cant find them online. I find it hard to express how I felt when I saw your interpretations of my dear departed boy, Smokey, the Prince of Cats. We got the painting today – our memory portrait of Gusto the boxer. I️ had to wait until tonight to open it with Steve for his birthday and the anticipation was killing me. Needless to say we are completely blown away. It is literally like we are staring into his eyes and just so life like. It is really is so much more than what I ever expected or imagined and I️ can’t thank you enough. You have captured him just perfectly. Thank you for your amazing talent. We will treasure it forever. We are simply thrilled to pieces with the wonderful art work you have done for us. During the process you were so professional and accommodating, I can’t thank you enough for always fitting in with our schedule. The end result was even better then we expected and being able to combine our thoughts with yours made it a piece of art that we will enjoy for years to come. As we always enjoyed our room before having this lovely art to look at there now, makes it even more a delight.